Mouse M-CSF R, Fc Tag (CSR-M5256) is expressed from human 293 cells (HEK293). It contains AA Ala 20 - Ser 511 (Accession # NP_001032948). The protein has a calculated MW of 81.8 kDa. As a result of glycosylation, the protein migrates as 100-130 kDa under reducing (R) condition, and 260 kDa under non-reducing (NR) condition (SDS-PAGE). 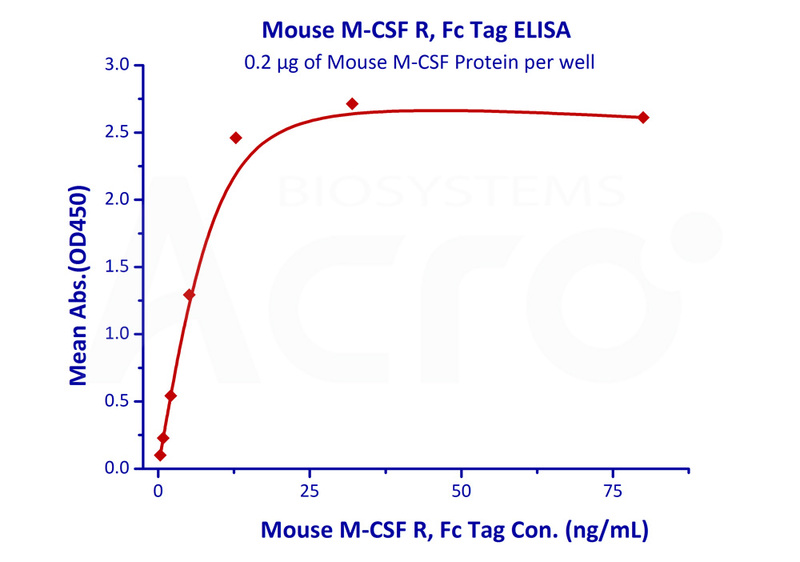 Mouse M-CSF R, Fc Tag on SDS-PAGE under reducing (R) and non-reducing (NR) conditions. The gel was stained overnight with Coomassie Blue. The purity of the protein is greater than 95%. 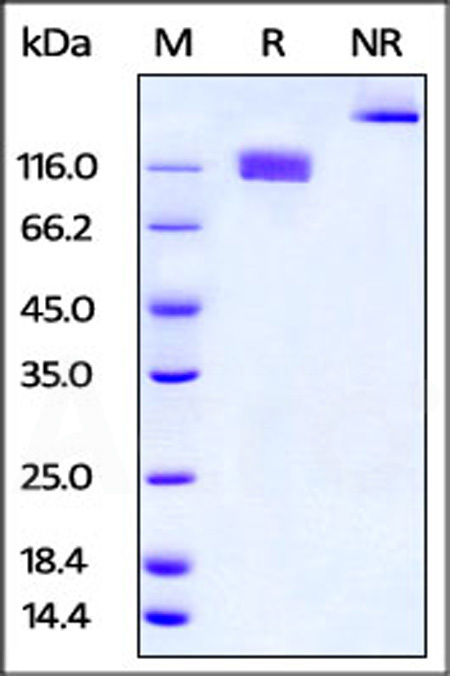 Immobilized Mouse M-CSF Protein at 2μg/mL (100 μL/well) can bind Mouse M-CSF R, Fc Tag (Cat. No. CSR-M5256) with a linear range of 0.3-12.8 ng/mL (Routinely tested). Colony stimulating factor 1 receptor (CSF1R) is also known as macrophage colony-stimulating factor receptor (M-CSFR), CD115 Cluster of Differentiation 115 (CD115), C-FMS, CSFR, FIM2, FMS, and is a member of the typeⅢ subfamily of receptor tyrosine kinases (RTKs). CSF1R is a receptor for a cytokine called colony stimulating factor 1, The protein encoded by the CSFR1 gene is the receptor for colony stimulating factor 1, a cytokine which controls the production, differentiation, and function of macrophages. This receptor mediates most, if not all, of the biological effects of this cytokine. Ligand binding activates CSFR1 through a process of oligomerization and transphosphorylation . Mutations in CSF1R are associated with chronic myelomonocytic leukemia and type M4 acute myeloblastic leukemia. Increased levels of CSF1R1 are found in microglia in Alzheimer's disease and after brain injuries. The increased receptor expression causes microglia to become more active. Both CSF1R, and its ligand colony stimulating factor 1 play an important role in the development of the mammary gland and may be involved in the process of mammary gland carcinogenesis. (1) Ridge, et al., 1990, Proc Natl Acad Sci U S A., 87(4): 1377-80. (2) Mitrasinovic, O. M., 2005, Journal of Neuroscience 25 (17): 4442–51. (3) Tamimi, R. M., 2008, Cancer Research 68 (1): 18–21. (4) Pollard, J. W., 1994, Proceedings of the National Academy of Sciences 91 (20): 9312–6. (5) Sapi, Eva, 2004, Experimental Biology and Medicine 229 (1): 1–11.